LEADING ferry company Stena Line is celebrating after winning top ferry company for a record-breaking 25th time at the annual Northern Ireland Travel and Tourism Awards. The ‘Best Ferry Company’ award was presented to Paul Grant, Stena Line’s Trade Director, Irish Sea North (ISN) at the awards ceremony last Friday (October 20) at the Slieve Donard Resort and Spa in Newcastle, Co Down. 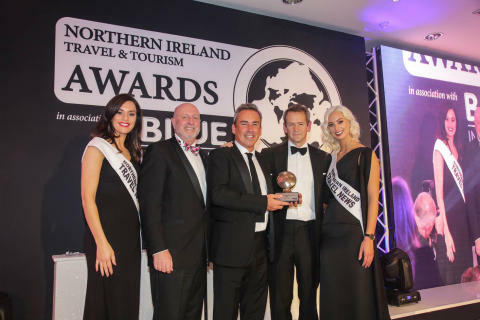 Northern Ireland Travel News has organised these prestigious awards for the past 26 years and this year’s ceremony was hosted by BBC's Pointless presenter Alexander Armstrong. The ceremony was attended by more than 430 guests and travel industry VIPs from all over the UK and Ireland. Almost 30 awards were presented on the night, decided by votes from the travelling public, the travel trade, and by travel and tourism industry leaders. Orla Noonan, Stena Line’s Travel Commercial Manager (ISN) said: “It’s an honour for Stena Line to receive this prestigious award coming as it does from our peers across the travel industry. “Although this is our 25th consecutive year of winning the award we take absolutely nothing for granted and realise that each year we have to work even harder to provide our customers with a service which really is ‘award winning’. “Whilst the travel industry is constantly changing and reinventing itself in an increasingly digital world, putting the needs of the customer first, every time, still remains the key objective for our business success, “added Orla. Stena Line is the largest ferry operator on the Irish Sea, offering the biggest fleet and the widest choice of routes between Ireland to Britain including Belfast to Liverpool and Heysham, Belfast to Cairnryan, Dublin to Holyhead and Rosslare to Fishguard routes, a total of 228 weekly sailing options between Ireland and Britain. Stena Line also offers a direct service from Rosslare to Cherbourg with three return crossings a week. The company carries approximately three million passengers on its Irish Sea routes each year, more than its rival ferry operators combined. MEDIA ENQUIRIES: For further information, please contact Lawrence Duffy of Duffy Rafferty Communications on Belfast +44 (0) 28 9073 0880. Stena Line operates the biggest fleet and the widest choice of routes between Ireland and Britain with an extensive route network including Belfast to Cairnryan, Belfast to Liverpool, Belfast to Heysham, Dublin Port to Holyhead and Rosslare to Fishguard. Prior to publication, it must be approved by Stena Line .